You have finally said “I do” and now you’re in the process of planning your wedding. With so much information and organization involved, it can be quite daunting. Don’t worry - Nada Gokal founder of Vintage Bloom is here to help. To simplify the process, Vintage Bloom has put together a quick go-to guide for everything you need when starting to plan your special day. Start a wedding folder - save any wedding images you like in order to get inspiration for the look and feel of your wedding. This is the perfect opportunity to use Pinterest and set up your own personal folder. Start to write down your guest list - this allows for a rough number of people who will attend to develop which will in turn help with your wedding budget. Four Seasons Hotel Jumeriah Dubai: A glamorous beachfront setting for Dubai wedding celebrations, Four Seasons Resort Dubai at Jumeirah Beach offers an exclusive wedding arrival area off the driveway that is ideal for welcoming guests. Host up to 360 guests in the impressive sun-lit Dana Ballroom, open to a beachfront lawn and terrace, or find the perfect venue for an intimate celebration. Four Seasons will help you custom-design an unforgettable occasion. Zaya Nuria Island – Abu Dhabi: Stemming from the Arabic word "Nur" meaning light, Nurai is an island of staggering beauty, of turquoise seas and white sands. It's a place filled with natural harmony appealing to all five senses. Beach wedding? Sounds about right! Flame torches, sand floors, and endless sea views. Nurai offers a unique selection of luxury event venues across the island for wedding ceremonies and renewal of vows. Only one-hour journey away from Dubai, our magical island gives you an opportunity to organize your dream wedding on the beach. Celebrate this special day with your beloved ones by your side. Contact our dedicated Events Team for the wedding of your dreams. Emirates Palace – Abu Dhabi: A lavishly imagined dream, Emirates Palace offers you a magical location to enjoy the quintessence of award-winning 5-star luxury hospitality and authentic local experiences. From 394 luxurious rooms and suites, to our award-winning culinary cuisine, Emirates Palace is the definition of an unrivaled and Arabian fantasy. Every wedding is uniquely special, but an Emirates Palace wedding is exceptional.Picture a breathtaking ballroom ornate with marble and gold, blending timeless architectural features with modern design, or 85 hectares of manicured gardens and elegant terraces offering the most glamorous venues for weddings in the UAE. We provide the best options for rooms and reception areas along with a flower shop on site to coordinate all of your floral needs and a talented culinary team ready to tantalize your guests’ taste buds. The possibilities for your special day are magically endless when you plan your wedding in Abu Dhabi. Address Montgomerie, Dubai: Offering an elegant venue for a bespoke event, the ballroom can accommodate up to 600 guests for a reception, 300 guests for a banquet and can be divided into three individual sections. Making the venue a spectacular location for a wedding that will remain as a memory for a lifetime. Customized menus crafted by our international chefs add the right creative culinary flourish to make your event memorable. Our highly trained banquet team complements the bespoke décor making your event unique and mesmerizing. You deserve nothing but the best as you exchange vows, and our team treats your occasion as their own, from welcoming your guests to planning your honeymoon stay. 4. Wedding Planners: Meet with a wedding planner who can provide you a more detailed personal approach as she will become the person who will hold your hand through the whole wedding process and streamline everything in order to ease the pressure. My Lovely Wedding started back in 2012 when I was a bride-to-be and decided to blog about my own personal bridal journey. My story seemed to resonate and the feedback from those original blogs motivated me to continue writing. This motivation, along with the support of so many couples and vendor partners, has enabled me to grow My Lovely Wedding into my dream job. I get to style weddings, play with flowers and make weddings pretty. Today My Lovely Wedding is not only a wedding blog; it’s a platform for inspiration to others getting married. At My Lovely Wedding we offer full planning and styling, and our aim is to make every bride's wedding dream come to life, with the help of our lovely vendors. We ensure each event is thoughtfully produced with equal parts of quirk and sophistication to create lasting impressions. For our private clients, we specialize in event conceptualization and execution for weddings and social functions. We take on a very personalized approach - it is not just about organizing an event, it is about being hands on. We take the time to learn about each couple and inject their personality into all the event elements. We are also available during each event, to guide our couples each step of the way and give them support on what is undeniably an exciting but overwhelming day. Bianca Event Styling ​is a full-service event management company that provides complete planning, consulting, and styling for weddings, corporate and social events. Bianca provides its clients with spectacular events through creativity and uniqueness based on individual tastes and preferences. 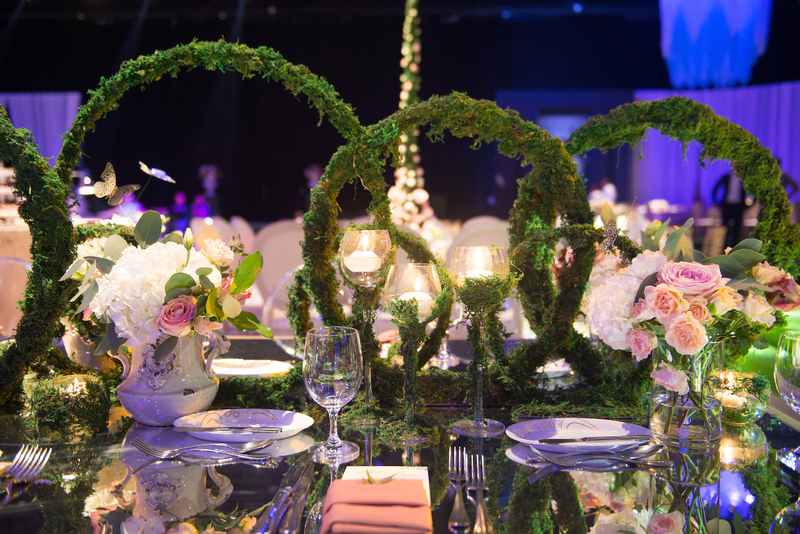 Whether the event is corporate or social, Bianca Event Styling incorporates themes, design layouts, event styles and décor with the ultimate goal of making your event a most elegant, unique, and memorable experience. Our goal is to exceed the expectations of every client by bringing a fresh and innovative approach to event styling and offering outstanding event management right from planning to execution. Party Social is an event rental company, we cater to individuals, event planners as well as corporate clients. If you’re in need of tables and chairs for a home party, an elegant table setup for a corporate dinner function or beautiful furniture for a wedding, we can provide you with a variety of pieces. We invite you to take your time and look around our site, browse through the ready-to- rent collections, check out our inspirational galleries or put through an enquiry for an upcoming event. Rebecca Hobday is a professional photographer with over 10 years’ experience working in Dubai and the Middle East. She has photographed many different types and cultures of weddings – from intimate beach weddings with only the bride and groom – to large-scale weddings in the citadels of ancient cities. Her wedding style mixes reportage shots with some classic poses to really encapsulate the magic of the day. Now you have your date and venue in mind, its time to start working on your wedding cards. The Entertainment Design Company, one of the world's top luxury stationary houses, has announced the launch of its first international flagship store in Dubai. Conceived as a lounge where customers can enjoy highly personalized development and design services, this store is expected to pioneer the notion of bespoke and one-of- a-kind invitation stationery in the Middle East. The Entertainment Design Company (EDC)’s portfolio includes design and production services rendered to princes, princesses, heads of state, and Bollywood superstars including globally recognized names such as Aishwarya Rai, Aamir Khan and Amitabh Bachchan. Most recently, EDC conceptualized and created invitations for several royal families in the Gulf. The King of Bhutan and the President of Malawi are also some of their eminent clients. Rami Al Ali specializes in creating innovative designs through unique craftsmanship. Each collection is a true reflection of the brand’s DNA, showcasing a fusion of cultural aesthetics; subtly coordinating a blend of East meets West. Using only the finest materials, each design exhibits glamour, at its very best. The Bridal Showroom and the perfect shopping experience go together like hot chocolate and marshmallows, the perfect couple. With the dreamiest line up of timeless hand-picked gowns, personalized experience and an all-star bridal consultant team, we continue to be to be one of Dubai’s most loved bridal boutiques, 5 years and counting. Wedding designers include Madison James, Legends by Romana Keveza, Hayley Paige, Anne Barge, Sareh Nouvi, Theia, Soft bu Rosa Clara. White Almonds is the first luxury bridal service of its kind in terms ofservice and flexibility. We focus on highly personalized graceful gifting solutions for weddings within the region. Our Bridal Consultants will help you create your own private wish list or gift registry for your special day ensuring you receive gifts you cherish, in addition to advising you with any other bridal related queries you may have such as gifting favors and bridal accessories. This can be done by a private appointment in our stunning showroom or a place of your convenience. organizing their flowers until the last minute. Keep in mind between October and April it’s the busy season so florists get bookings in advance and you need to consider your budget. It is actually a really enjoyable part of the planning which you can do with family or a friend or with your wedding planner. Remember to take inspiration from Pinterest and bridal magazines and show them to your florist of choice so as she can put her spin on the idea/design. Some bakers require a long lead time and we suggest food tasting in advance. Again, use Pinterest for wedding cake inspiration. Sweet Stuff: This American inspired boutique bakery offers custom wedding cakes that are both scrumptious and beautifully designed. They are known for their bespoke creations - details and colors of any cake can be customized to match a bride’s dress and bouquet to perfection. Flavors are traditional (chocolate, vanilla, red velvet). Vik Jethwani Fine Jewelry is a Dubai-based boutique jewelry house created by husband & wife duo Vikram & Natasha Jethwani. Specializing in bespoke and contemporary fine jewelry, their collections feature a wide range of diamond, pearl and semi-precious stone jewelry pieces which are suitable for everyday and for special occasions. Vik Jethwani Fine Jewelry also offers an exclusive bespoke wedding service and can create engagement rings, wedding rings and any other special wedding pieces you may need. At Amara Spa, we customize your experience using ancient healing philosophies derived from the natural elements of sapphire, ruby, emerald, and diamond. These precious jewels, each with their own physical and spiritual benefits, combined with the finest products, Arabian teas, and authentic delicacies, ensure an unforgettable and personalized experience. Amara Spa uses top quality brands such as Natura Bissé, an innovative leader in the development of high performance skincare products. We also use products by Anne Semonin, which uses unique serums and intensive complexes that are customized for each individual skin type to provide optimum results. A contemporary private boutique hotel evoking the traditional Sri Lankan Tropical Bawa style of architecture with a modern beach feel. Arabella on Boossa is located directly on the beach and offers a chlorinated swimming pool within the beautiful manicured gardens. Submit to Bali’s purest embrace at Four Seasons Resort Bali at Sayan: a 60-room sanctuary cocooned in the enchanting Ayung valley. Restore the subtle inner energies with yoga and meditation in the lotus petal Dharma Shanti Bale. Connect with nature and cross the Ayung River to explore the verdant surroundings. Savour the simplicity of rice planting with local farmers. We have but one philosophy here. Leave your worries at home. This is a place of positive energy, and nothing is ever going to change that. So kick back, relax, and forget about everything but the gentle, warm breeze embracing you. The incredible MAIA Luxury Resort & Spa is an Indian Ocean jewel located amongst the lush foliage and azure waters of Mahé island in the Seychelles. A private peninsula, with sweeping views over the Indian Ocean, MAIA is a BEYOND all-inclusive resort, ensuring that your time spent with us is a signature experience unlike any other you will find in the world. We highly recommended meeting May from The Wedding Haven. They focus on weddings in Dubai and worldwide. So far, they have organized weddings in the Dominican Republic, Mexico, Canada, U.S., Cyprus, Greece, Croatia, UAE, and Jordan.